The first commission meeting of 2015 took place Tuesday night and while it was mostly a routine agenda with no real action, there were several important topics discussed. Treasure Island Elementary School - For four years TIES has been on the decline. It went down a grade year by year on the FCAT rankings and its most recent grade was "D", a short step above failure. The village has been funding the International Baccalaureate program for the second year in a row and there is a lot of concern that the school itself has become unstable and looks like it's on the path towards failure. The village commission have refused to address this issue publicly and in fact had no plans to discuss the academic performance as of last month. Still, after they were pushed into the discussion, the new principal, Dahlia Villar, spoke at the meeting on Tuesday. It was impressive. Her presentation was short and to the point. Ms. Villar discussed the new tutoring programs in place, the enhanced support for the teachers, the district monitoring of student progress and the variety of measures that are being used. She alluded to the upcoming shift in how schools are ranked under Florida standards and made no promises but the impression was clear that the turnaround, the real one, is on the road to recovery. She mentioned in passing a very telling performance indicator - teacher absenteeism is down drastically from October when she took over. In October as many as 15 teachers were out "sick" on a given day to 1 this month. This matters. Unhappy employees have more illness and use more sick time and this is a clear indication that the school is on the right track. I wish she had been more detailed in her presentation but I have to say, Ms. Villar is clear, to the point and shows the confidence of competence. These were all lacking previously and I am more comfortable that our school will recover under her leadership. Harbor Island Parking - Last February, the village held a workshop on the Harbor Island Parking situation. The take away was that the village administration did not have the facts or stats and a further workshop was promised. It's still promised a year later. Village Manager Frank Rollason said it will take place sometime in February. Let's wait and see. The Village Bus - according to the Village Manager, the bus now connects to the Miami Beach Trolley system. He said that the information was on the village website but as of today it is not. Mr. Rollason often claims credit for what has not been done. The Tot Lot - while money continues to pour into the bay at Paul Vogel Park, the Tot Lot on Treasure Island has deteriorated to the state it is in today. Mr. Rollason says it will be renovated by the end of the fiscal year. Let's see. 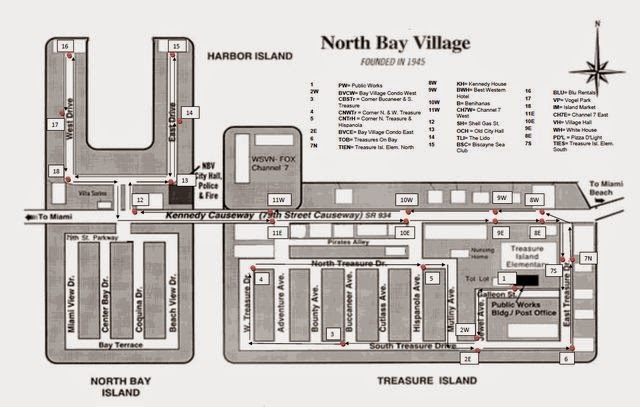 The Boards - There are only two boards currently in North Bay Village - Community Enhancement and Planning & Zoning. The chair of the Community Enhancement Board spoke about the frustration of not even knowing if the commission had heard their recommendations, let alone plans to act on them. This is absolutely true and the direct result of the Mayor's venal hatred of disagreement. Lip service was paid to listening in the future. There was also a final vote on Mr. Gonzalez's project to create an advisory board to address the needs of residents with disabilities. It will go forward without a clear mission, without the mayor's support and without known participants. Finally, the issue of why people don't apply to boards was brought up. Nobody mentioned that since the village manager does not seek information and the mayor and commissioners ignore or actively attack board members who take their positions seriously so the commissioners continue to scratch their heads and wonder what went wrong. "At this point, I don’t really have solutions." We can assume that Comrade Gonzalez is completely clueless about how public access should work. Facebook - There is a group on Facebook called "North Bay Village Residents Speak" and it gives a space for residents to discuss things about the village. It does not pretend to be an information outlet. In full disclosure, I run that group. Residents bring up issues there regularly. Since the Village has no social media presence, the meetings themselves are televised but without sound and there is no printed media, it is often the only place to find out what is going on. Among other successes, this month without any formal requests, the group raised over $500 for the care of an injured cat, discussed the parking issues and possible solutions for Harbor Island, worried about the abrupt closure of the Food trucks on Pelican Island, discussed the school issues, and shared a good deal of information about cultural events including a local Optimist Club essay contest. I have long recommended that the village create a social media page on Facebook to improve communications with the residents. Mayor Kreps and her consort Vice Mayor Gonzalez hate this. The Mayor heard from "people" that sometimes "people are blocked on Facebook" so it's no good. If "people" told her that, she does not have the right information. I have only blocked two people for bullying and trolling. I am never sure if she is simply dumb or if she is dishonest. Perhaps both. Regarding Gonzalez, however, I am sure. I did block him finally after several warnings. Gonzalez was bullying local residents, posting while blocking comments from others, and using the site to troll. If he had simply allowed comment on his postings, he would still be on there today but he would not. So he's out. Mr. Gonzalez is an authoritarian bully and he's not welcome on any page I host. His style of bombast is more welcome in Cuba or North Korea than on an American site. Still he is on the commission. I know that he, the mayor, the village manager and most of the administration regularly read the group. It would take them a half hour to set up a group more to their liking but their liking is to keep the residents in the dark. Nothing threatens a poor government worse than an informed citizenry. I intend to keep informing them. So that's your first month wrap up. Tune in for further information and join the conversation at "North Bay Village Residents Speak".